Our World: Bardi Jaawi Life at Ardiyooloon is a non-fiction text created by people of the Ardiyooloon community. This book invites the reader to gain insight into the traditional life, cultural knowledge and language of the Bardi Jaawi people. It highlights the importance of elders to the community and to the future lives of the young people. The book includes historical information, informative texts, recounts from students, procedural texts and traditional stories of the Bardi Jaawi people. Together these texts introduce and inform the reader about the community. To connect students’ prior knowledge and understanding of the text it will be useful to begin by focusing on the title of the book, Our World: Bardi Jaawi Life at Ardiyooloon. Read the title to the class and have it written or displayed in large writing on a board. Draw student’s’ attention to the words ‘One Arm Point Remote Community School’, with a focus on ‘Remote Community’. Invite students to complete a think-pair-share based on the meaning of these two words with the following prompts. Where in Australia might it be classified as remote? Do you know of any remote communities? Have you ever visited a remote community? On completion of a whole-class share, establish an agreed meaning for the words ‘remote’ and ‘community’. At this stage you may wish to consult with a published definition for clarity. Now that students have had time to discuss and confirm a definition for ‘remote’, point out the name of the community and its people ‘Bardi Jaawi, Life at Ardiyooloon’. Explain to students that Bardi Jaawi is the name for the people and Ardiyooloon is the name of the community. This is a book about the life of people who live in a remote community. As a class write a general outline of a week day or weekend, discuss how and why this could be different to the children that live in the community described in this book. Prior to beginning reading the text you may wish to complete a Welcome to Country. Briefly discuss this and why it is important. Read the first paragraph of the blurb of Our World: Bardi Jaawi Life at Ardiyooloon to students. Pose the question ‘Where is Western Australia?’. Ask students to draw a map of Australia with all of the states and territories shown. Display some of the students’ maps. Use this to come to a consensus of where Western Australia is located. Use Google maps or another map of Australia that shows the states and territories and invite students to re-draw/modify their map if required. Around the outside of their drawn map, guide students to write down any information that they already know about Western Australia. Invite students to work in pairs or small groups to use an atlas or Google maps/Google Earth to locate their town and the community of Ardiyooloon on a map of Australia. Students draw and label this on their map. Ask the students how we could find out how far it is from their town to Ardiyooloon. Research this as a whole class. Students place the information on their map of Australia. The blurb states ‘…the community is surrounded on three sides by the salt water that plays such an integral part in the people’s lives.’ Brainstorm how salt water could be important, drawing students’ attention to the illustrations on both the front and back page. Ask what natural resource or industry is a major part of their own town/community. To compare the salt water and the students’ own towns natural resource or major industry, ask students to complete a venn diagram. Invite students to share and discuss the diagrams within small groups. 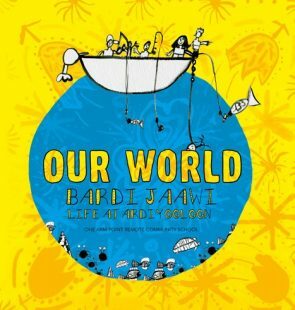 Explain to the class that the text Our World: Bardi Jaawi Life at Ardiyooloon is a non-fiction text containing a variety of text types. Direct students to fold an A4 piece of paper in half, on one half students draw a small illustration of their favourite fiction book and on the other side of the paper their favourite non-fiction book. Around the outside of the two books students are guided to list the features of both types of texts. On completion, come together as a whole class to compile a list of the features of a non-fiction text in order for students to gain a deeper understanding of the layout of the text. Students work independently to compile a list of ‘I wonder’ questions that they have about the book. Ask students to choose one of their wonder questions to share with the class. This wonder can be written on an A5 piece of paper and displayed on a designated wall space for the text. Begin reading the book by starting on the map page. If possible project the map onto a whiteboard for students to see. Invite students to discuss the items they can see on the map, for example the airstrip and the one main road into the community. Read through the contents page and discuss the different aspects of life on this remote community that is contained in the text. Refer students to the previous discussion on what a typical day may be like for them. Are there any similar activities within the community? Move the class to an outside area within your school where you are able to sit down and read part of the book. Read the introduction and ‘Our History’ on pages 9–11. Point out the sentence on page 11: ‘The students sat on the clean beach doing their lessons by correspondence through the radio’. Ask students to close their eyes and imagine the feel of the soft sand under them, hearing the gentle waves wash up on the beach and feel the warm sun on their skin. Ask students to think about the positive and negatives of attending school outside as the children did at Middle Beach in 1974. Students share their responses. Lead a discussion into how students think the school life may have changed from then to now at Ardiyooloon. Remind the class that this text is a combination of information texts, recounts from students, procedural texts and Indigenous stories. Who is ‘we’? Do you think it is only girls? Why didn’t they collect the smaller mud crab? Why did they need to be careful when walking through the mangroves? Conduct a whole-class discussion focusing on ‘Plus, Negative and Interesting’ for these three passages, recording some of the students’ thoughts on large paper to refer to later. A plus will be things students liked in the text or illustrations that they related to/agree with/want to learn more about. A negative might include things that students did not like/did not agree with/did not understand. Something interesting might include things that students learnt about and found interesting and want to learn more about. Around the border of the pages are English and the Bardi Jaawi language words. Display these to students and practise reading and pronouncing them. Refer back to the front page of the text (the two pages with the maps of the community) for pronunciation guidelines. Spend time dedicated to learning the correct pronunciations. As a whole class create an English and Bardi Jaawi dictionary Power Point Presentation. Within the presentation each slide will be dedicated to one word, showing it written in both English and Bardi Jaawi and a recording of students saying each word. This will become a class resource for students to refer back to during future lessons. Move on to pages 16 and 17, start by reading the ‘Digging for Water’ paragraph. Invite students to complete a think-pair-share on why they think the boys and girls attend separate camps. Read the remainder of the text on pages 16 to 19. Have students independently complete a reflection on the text read so far by completing a ‘Positive, Negative and Interesting’ chart. Students can be given the opportunity to share and discuss one of their points with the class. If children are not familiar with Indigenous stories share one with them, such as Scaly-tailed Possum and Echidna by Cathy Goonack. Discuss traditional Indigenous stories, focusing on the way stories are told in order to pass on important cultural information from ancestors. Stories generally focus on the physical world, human world and spiritual world. In order to share the four traditional stories with the class, organise students to participate in a Reader’s Theatre. Prior to allocating stories to groups, have a Word document copy of the short story broken down into five to six parts so that each group member has a part to read and present. Divide students into four groups, allocating one of the traditional stories from Our World to each group. Direct groups to read through the story and allocate parts. Groups are given time to read through, learn their part and discuss any words that they are unsure of. Groups can record a practice session to self critique for pace, volume and clarity before presenting to the class. Over a week, allow time for each group to present their Reader’s Theatre to the class. At the conclusion of each presentation allow students to engage in a think-pair-share to discuss the importance of each story, the structure and the main message behind the story. Final Reader’s Theatre presentations could be recorded and placed on display within the class or school environment (examples: at an assembly, school front office digital display, class or school website/app). Revisit the four traditional stories that were previously shared through Reader’s Theatre. You may want to read through them again or view any recordings that were made. Refer back to the discussion on why and how Indigenous Australians use traditional stories. Invite students to share their thoughts on how groups, such as Indigenous people, have different world views on how things were created. The main focus of the story (physical world, human world or spiritual world). Presentation ideas include a mind map or use of an app such as Popplet or Stop Motion. If Stop Motion is being used, students have the opportunity to work in pairs to re-create the traditional story and include either text or voice over covering the report ‘must haves’ at the end of the recreation. Allow time for students to present their work in either a small group or whole class setting. Presentations could be recorded to be placed on display within the class or school environment (examples: at an assembly, school front office TV, class or school website/app). How are the pages set out? How are illustrations and photos used? What types of techniques/materials have been used with the illustrations? What is special about the page border? Invite students to share their thoughts. What text types are used? What type of visual techniques are used? Why do you think the writers have chosen to present the information in this way? List three interesting things that you have learnt from the information you have read. On completion each group presents their information to the class. After each group has presented, the class agrees on a text features anchor chart display that outlines the main parts of the text for Our World: Bardi Jaawi Life at Ardiyooloon. Include details on each of the questions/prompts listed previously as well as information on the use of traditional stories that was looked at in the Responding section. Invite students to record one positive thought on the text structure of Our World: Bardi Jaawi Life at Ardiyooloon on a sticky note, and place these around the text structure display. The illustrations, colour, symbols and design are a large part of the text. Show students some of the different art techniques used by Aboriginal people at the Artlandish Aboriginal Art Gallery and the Art and Technology for Kids websites. Ask students if they have seen any examples of these styles and symbols in the text. Discuss art techniques unique to different Aboriginal communities. Now display the pages suggested by students and discuss what art techniques have been used and how it adds value to the text. Look at the Hunting section (pages 40–41) and the animal track symbols used. Direct students to create their own Aboriginal inspired artwork that includes one of the animal tracks and one of the Aboriginal art styles that they have identified as being used by the Bardi Jaawi people. Our World: Bardi Jaawi Life at Ardiyooloon uses a combination of English words and traditional Bardi words. At the beginning of the text there is a pronunciation guide for Bardi words. Revisit this with the students and practise pronouncing each sound. Around the border of many of the pages are the English and Bardi words related to the topic. Furthermore, pages 22–23 are dedicated to English and Bardi words and page 63 features an English-Bardi word list. Create a class word wall by asking students to choose one Bardi word and the English translation to create an A5 display. The A5 piece of paper must have the English word, Bardi word and an illustration. A large part of the text is dedicated to recounts written by children from the Community School. The assessment task requires students to adapt one of the recounts into a poem containing Bardi language. Re-read Camping at Gooda (pages 16–7). List the five senses on a white board and discuss how the cycle of seasons differs from the cycle of seasons in the students’ locality. Next to each sense create a line for the poem based on the read text. Some senses may be more difficult than others, in this instance students may repeat one of the senses. Ask students to close their eyes as the above poem is read out loud, and invite them to imagine that they are there. When students have opened their eyes ask them what feelings and sensations they felt. Invite students to insert their own words into the poem, rereading each time to see how the mood of the poem changes. For example ‘I feel the glorious mud squish between my toes as we search the mangroves (biindoon) for mud crabs’. Direct students to re-read the section of text that they used to examine the text structure with and use part of this to create their own five-senses poem as if they were the person writing the recount. Encourage students to use both English and Bardi language, which can be located on the word wall. In small groups, invite students to complete a Venn diagram to compare One Arm Point Remote Community School to their own school. The Venn diagram could include comparisons between location, climate, excursions, camps, food and activities. Display these around the classroom. At the completion of the study of this text the class may wish to share their learning experiences with other members of the school and community and discuss the points of similarity and difference and how these points of difference are to be celebrated. Prior to reading Our World: Bardi Jaawi Life at Ardiyooloon the majority of students were most likely unaware of the location of this community. Throughout the exploration of the text students will have gained an insight into the community and the wonderful cultural experiences that children are able to participate in. Display a number of tourist brochures to students from other Indigenous sites such as Arnhem Land, Ulura or Kata Tjuta. Discuss and list the features of this text format. Talk about the European names for these places and why it is respectful to use Indigenous names. Talk about the words that provide the feelings, positions and judgements. Brainstorm the information that could be placed in a brochure for the Ardiyooloon community. Invite students to create a brochure for the Ardiyooloon community, including a map of where it is located. Direct students to the English/Bardi word wall for inclusion in the brochure. Scaffold the students to focus on the words that provide the feelings, positions and judgements. In the Responding to Literature section students spent time looking at traditional Indigenous stories. Refer students back to the video of the Reader’s Theatre that they shared with the class and discuss the text features of the traditional stories. Invite students to research traditional stories from other cultures. In small groups have students choose three and create a Venn diagram showing the differences and similarities of traditional stories from various parts of the world. Each small group can then prepare to publish their findings in written or digital formats, such as a Word document, PowerPoint Presentation, Stop Motion or Book Creator. One Arm Point Remote Community School chose to share their culture with the rest of the world through this text. Living in a remote part of Western Australia, many of the One Arm Point children may not have traveled to other states or territories within Australia. Ask students which aspects of their own school and/or community they think would be of interest to the children at One Arm Point Remote Community School, brainstorm as a whole class and create a list (you may refer students to their completed Venn diagrams). Refer students back to the text structure display and how the pages of Our World: Bardi Jaawi Life at Ardiyooloon are presented. Discuss with students which items from the list could be a recount or procedural text. Ask students to create a ‘page’ for a class book that could placed in the school library or perhaps be sent to One Arm Point Remote Community School. and any other appropriate items that were placed on the class text structure display wall. TEGAN POPE has been teaching in the primary school setting for over ten years in the Northern Territory and more recently in South Australia. Her teaching strengths lie in the middle and upper primary school areas. She has also been a teacher librarian where she was able to share her love for reading and literacy with both students and teachers and help students from across the school catch the reading bug! She views good quality picture books as not just stand alone ‘reading’ material but as mentor texts to guide and support students’ writing. Tegan recalls being welcomed into the world that books can lead you when she was in Year 1 when her teacher read The BFG by Roald Dahl to the class. From that day on she was hooked. She would like to be able to pass on the same passion for literacy and authors as that teacher did for her.